PLO, PA parliament member joins violent 'Naksa Day' riots throwing stones at IDF; reportedly wounded by stun grenade. A senior Fatah official was reportedly injured on Thursday while taking part in a violent "Naksa Day" riot, in which protesters threw stones at IDF forces at the Kalandia checkpoint just north of Jerusalem. The official, Mustafa Barghouti, is the General Secretary of the Palestine National Initiative, a member of the Palestinian Authority (PA) parliament, and member of the Palestine Liberation Organization (PLO) Central Council. According to the Arab Ma'an News Agency, Barghouti was injured in his right leg by stun grenades thrown by IDF soldiers to clear the riots he was part of. The annual "Naksa Day" riots are meant to demonstrate against the 1967 Six Day War liberation of Jerusalem, Judea, Samaria and the Golan Heights by Israel. The Arab news source claimed that in addition to stun grenades, tear gas was also used against the protesters, and that several of them choked on the gas as a result. 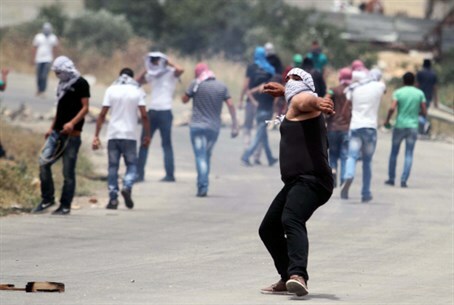 The IDF reports that it is unaware of any injured Arab protesters from the incident, in which roughly 50 Arab rioters threw rocks at security forces, reports Yedioth Aharonoth. While PA Chairman Mahmoud Abbas's Fatah faction has often been presented as more moderate in the West, in contrast to the terrorist organization Hamas, the two formed a unity government this Monday, which included three Hamas-backed ministers from Gaza. Further, an Arab terrorist who shot at IDF soldiers on Monday night at Tapuah Junction in Samaria was revealed to be a Fatah member. The terrorist wounded one soldier lightly before being eliminated. For its part, the Fatah-led PLO, which is recognized internationally as representing the "Palestinian people" and has governed them until now in Judea and Samaria through the PA, has never rejected terrorism.